Pungent, sweet, cool; spleen, lung, stomach and large intestine meridians entered. Promote digestion, direct qi downward, resolve phlegm, stop bleeding, relieve thrist and induce diuresis. Indigestion, abdominal distention, diarrhea, sore throat, hematemesis, hemoptysis, nose bleeding, hematochezia, diabetes, cough due to phlegm-heat, acid regurgitation, stranguria with turbid discharge for oral administration; sores and boils, bruising, scalds and chiblain for external application. Eat it directly or take the juice, 30~100 g, or decoct in water, or cook it for eating. Proper dosage is for external application, pounded for applying or decocted for washing. Avoid taking Di Huang and He Shou Wu when using the drug. 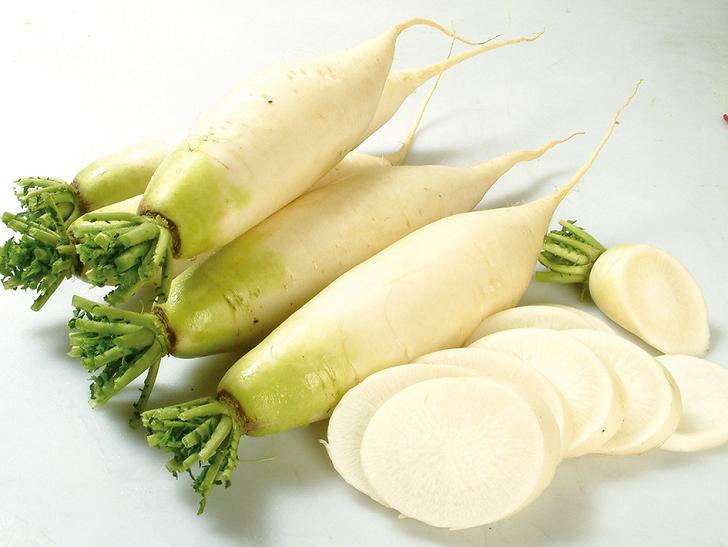 It is contraindicated in case of deficiency cold in spleen and stomach.